The sources who confirmed the allergy stressed not to make fun of it, with one saying, “It’s only funny to anyone who’s never had it.” Details are sketchy, because no one would give full information, but the medication necessary to combat the allergy is potent enough that doctors wanted his blood tested every few weeks to make sure there were no major side effects. That’s very serious stuff, and word is doctors worried about Hossa taking the medicine for extended periods of time. If that’s the case, it would be the end of a Hall of Fame career. No debate here, he deserves entry. If this is indeed the end of Hossa’s career, it is the end of one of the best careers in the history of the sport. With an impressive 525 goals and 1,134 points in 1,309 game, Hossa has had an impressive run in the regular season. Playing in the Stanley Cup Final in 2008, 2009, 2010, 2013 and 2015 – winning the latter three, Hossa has also had an impressive postseason career. In the playoffs, the Slovakian forward has scored 52 goals and 149 points in 205 games. Truly a Hall of Fame-worthy career, as Friedman mentions. Even at 38 years old, Hossa proved that he can play a big role in the league, scoring 26 goals and 45 points in 73 games in the regular season last year. If Hossa retires, the Blackhawks could also be on the hook for a significant recapture penalty until the 2020-21 season. Due to the nature of Hossa’s contract and the fact that his 12-year deal was severely front-loaded, the Blackhawks could have a penalty of $3.675 on their cap hit for each fo the next four seasons – a devastating number for a team already looking to shed contracts. 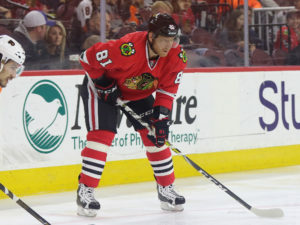 This might not be the ultimate result for the Blackhawks, however, as they could be granted the opportunity to place Hossa on the LTIR – something that has been used many times in recent history to grant teams some extra space on their salary cap. If that is an option for the Blackhawks, they could do so in each of the remaining for seasons of Hossa’s contract to completely erase his $5.275 cap hit. Examples of players who have been placed on the LTIR that have allowed teams to recover their cap hits include Chris Pronger with the Philadelphia Flyers prior to being traded to the Arizona Coyotes – who also used this tactic, Joffrey Lupul and Stephane Robidas in Toronto, and the Boston Bruins also did so with Marc Savard for a few years following his concussion and prior to trading him out of town to get his salary off the books. It’s awful to consider that Hossa’s career could be over prematurely, especially with something as seemingly harmless as an allergic reaction. As Friedman’s source mentions, however, this allergy is nothing to joke about and is something that could legitimately cost a tremendous player his career. Chris Hine of the Chicago Tribune mentioned on Twitter that an official statement from Hossa, the Blackhawks or potentially both parties is expected soon and potentially as early as June 21 (the day following the initial release). More will come from this story, but as it stands, it’s truly a sad day for Hossa, the Blackhawks, and the hockey community as a whole.